LoveToKnow Movies turned to Michelle Mari, a Mr. and Mrs. Smith movie extra, for the inside scoop on the hottest jobs. Whether you are a professional actor, a hobbyist, or just an everyday Joe, you could be in the movies! There are openings for extras of every age, shape, ethnicity, and skill set. Michelle Mari has a "day job," but she enjoys working as an extra when she gets the opportunity. "Movie and TV sets are relaxing and fun to me," she explains. "I write for a living, but I work as an extra as a fun hobby." LoveToKnow (LTK): How do you go about getting jobs? Do you need an agent? Michelle Mari (MM): The best way to sign up is to go through an established extras casting agency. You can find a list and sign-up information in the book "Extra Work for Brain Surgeons." If you are in Los Angeles, I'd recommend signing up with Central Casting. They have a long history, cast the most shows/films, and can give you a feel for the industry. There are two ways extras are categorized: union or non-union. Union extras have already received their Screen Actors Guild (SAG) card and non-union are those who haven't. Those who are just getting into the industry are non-union. Extras casting agencies like Central update their phone lines throughout the day with available jobs for the next day or week. If you hear one that applies to you, you can call them right away and they will let you know if you are a fit. Some extras use calling services that book jobs for them (for a minimal fee) so that they don't have to keep calling the casting line throughout the day. LTK: How is the pay for extras? Can someone make a living this way? MM: Most people use extras work as a way of getting their SAG card and breaking into the business. Achieving the SAG card takes time and usually involves being singled out for doing something special on the set such as actually having lines. SAG is in the process of creating a "points" system that would allow you to accumulate points for every job you work on. After taxes and other fees, you'll probably walk home with $50-120 per non-union job depending on the number of hours worked. And the check usually arrives in 1-2 weeks. My workdays have lasted anywhere from 4 to 18 hours, and they're always required to pay you for at least eight hours. The standard work time is probably 12 hours. Many extras are strapped for cash, so they take advantage of the food on the set, although this can sometimes aggravate the people working on the production! LTK: What advice would you give someone wanting to work as an extra? MM: Always show up to the set on time and with a great attitude. Only submit yourself for jobs that you are actually qualified for. If they ask for a woman in her 40s with blonde hair, don't submit if you're a 20-year-old brunette. Treat the actors, the crew and the casting directors with respect and you will go far. You will spend a lot of time on the set, so always have a good book or other quiet activity on hand so you can keep yourself busy during the downtime. And above all, have fun! LTK: Are there opportunities outside of Hollywood? MM: There are! New York is also a great place to get your start…and there are some other smaller markets. Also, many films are shot on-location, so keep an eye out in your local paper for opportunities! LTK: Is it possible to parlay extra work into acting jobs? MM: Absolutely. Even people like Brad Pitt got their start as an extra. But for most people, it does take some time to achieve your SAG card. Once you join, you can then start looking for a union agent who can submit you for speaking roles. You can use your experiences as an extra to learn about the industry. And in the meantime, begin taking acting lessons and hone other skills applicable to this field. Thousands of people come to Los Angeles with the dream of becoming a famous actor, but a very small percentage of people actually achieve that status. If you think this may be your dream, extras work is a great way of testing out the waters to see if acting is a good fit for you. Also take advantage of your time on the set to meet other extras. You never know where your new acquaintances may lead you! LTK: As an extra, do you prefer sitcoms or movies? Why? MM: My favorites are hour-long dramas or single-camera sitcoms like Scrubs. Most sitcoms tape in front of a live audience, so you practice during the day and then tape at night. Dramas shoot all throughout the day and you get to do more actual taping that way. Movies are really fun and can be very exciting, but there's more of a chance of your scene getting cut out of the final movie. However, there is a certain excitement to seeing yourself on the big screen. And there's always a chance your scene will be revived on the DVD's deleted scenes. It also depends on how patient you are. When you tape the half-hour shows, chances are you'll see your episode within a month or so, and it's about a 1-3 month wait with the hour-long dramas. When you tape a movie, it could be anywhere from six months to more than a year before you see the final product. LTK: Have you ever had a speaking part? MM: No. The chance of getting a line increases if you have a special talent or a special look. It's also smart to start building a good wardrobe. You'll need casual, business and upscale looks. And if you have any uniforms (nurse, police officer, etc.) that may increase the number of jobs you'll get. LTK: Have you ever had a case of the giggles during filming? MM: I've come close. When working with some of the funniest people in Hollywood like Will Ferrell, it's hard to stop yourself sometimes. You have to remind yourself that you're in the production and not watching it. You just try to get all the giggles out after they yell "Cut!" LTK: As you know, there are scams targeting extra wannabes. What are red flags that a company is not legitimate? MM: Most reputable agencies don't need to advertise in newspapers or magazines. They also don't require you to pay for acting lessons and purchase headshots with them. If you want to be an extra, the only fee you should have to pay to an extras agency out of your own pocket is the $20-30 it takes to sign up with them. If you find a place asking you for hundreds or thousands of dollars, run the other way! LTK: What were the working conditions like on the set of Mr. and Mrs. Smith?MM: I arrived at 6 a.m. and worked until around 11 p.m. It was a fun environment and they kept us working pretty steadily. On some sets, you may sit around for 12 hours and only work for one. But this one kept us working, which I enjoyed. LTK: Can you describe the actual set? MM: The set of this movie, an old IKEA building, was incredibly detailed and it was fun to look at some of the inside jokes featured in the set design. For instance, the menu of food items in the fast-food area of the store featured road kill entrees. And one of the other store signs said, "We love our customers so much, it's creepy!" or something to that effect. These signs would've been too small to actually read in the movie, so the set designers had a little fun with it. LTK: What was your part in the movie? MM: I played a store worker in a Home Depot-type place that served as the setting for a shoot-out with Mr. and Mrs. Smith and a bunch of assassins. You can see this scene on the Uncut DVD in Doug Liman's section under the title "HomeMade." LTK: Did you meet Brad Pitt and Angelina Jolie? MM: I didn't spend time talking to them or anything, but they were both very kind to the extras. Brad Pitt was riding around on a bicycle, which was the best entertainment we could ask for! Talking to the principal actors is forbidden unless they talk to you first. These people are at work, and to act like a fan is not professional and could result in a bad report from the person overseeing the extras. One girl tried talking to both of them. Thankfully for her, they were gracious and didn't report it even though it could have gotten her kicked off the set. LTK: What is your best memory from working on that set? MM: One of the actors in our scene was Efren Ramirez, Pedro from Napoleon Dynamite, and he hung out with us for a few hours and was really sweet and funny. While I was waiting for one of the scenes to start, I was hanging out with a guy outside of the IKEA. I later learned he was the director! LTK: What was unique about Mr. and Mrs. Smith? MM: It was the first production I did where all the extras got hair and makeup done. You usually do it yourself, so we felt special! We got to act while things were exploding and I got to flee from one of the assassins, so that was quite fun. 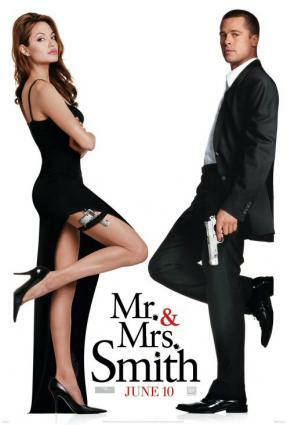 Mr. and Mrs. Smith is available on DVD.